Brass push to connect fittings union straight connects two same diameter tubing in same direction. 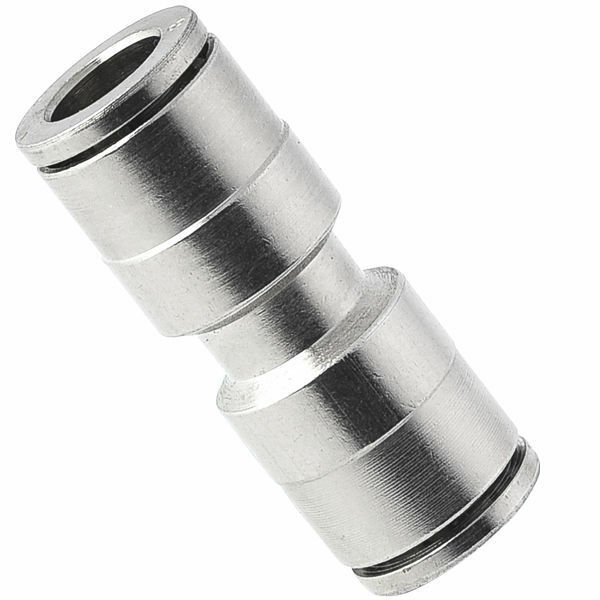 Thanks to their amazing durability, brass push to connect fittings are great alternative for plastic ones, especially in industrial working conditins (high temperatures, greater pressures). Full nickel plated brass push to connect fittings, also called brass push in fittings are suitable for typical applications include systems for pneumatic control, robotics, instrumentation, chemicals, anti-spatter or die temperature control. Accept metric and inch tube, and PT (R, BSPT), NPT thread and G(BSPP) thread. Working pressure up to 290psi (2Mpa or 20bar), working temperature from -20°C to 120°C (-4°F～248°F).